What are the best baby swimming pool safety practices? An adult should actively watch children at all times while they are in a pool and optimally shouldn’t be more than arm’s length away. You can’t count on a lifeguard to protect your baby. You need to be right there with your child. Setting and enforcing some pool rules will help you avoid some common water safety hazards. > Keep toys away from the pool when the pool is not in use. > Empty inflatable pools after each use. > No tricycles or other riding toys at poolside. > No electrical appliances near the pool. > No running on the pool deck. > Your swimming pool safety fence should be climb-resistant and should not have anything alongside it such as lawn furniture that can be used to climb it. > Completely surround the pool, separating it from the house and the rest of the yard. > Make sure your fence is at least 4 feet high and have no footholds or handholds that could help a child climb it. > Have no more than 4 inches between vertical slats. Chain-link fences are very easy to climb and are not recommended as pool fences. Consider a heavy duty mesh fence. > Have a gate that is well maintained and is self-closing and self-latching. It should only open away from the pool. The latches should be higher than a child can reach. > For above ground pools, keep children away from steps and ladders. Remove or lock them when not in use to prevent access by children. > Automatic pool covers are not a substitute for a pool fence. If you get one, it should cover the whole pool. Also, make sure there is no standing water on top of the pool cover. > Additional safety measures include using door alarms and pool alarms, window guards and self-closing doors, so your little one doesn’t slip out. Your child may not be developmentally ready to learn to swim until he is 4 years old. 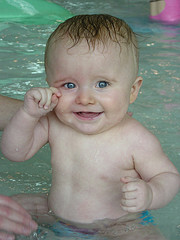 Children enjoy swimming lessons, but they do not necessarily make babies and toddlers safer in the water. When your child is developed enough, swimming lessons can be a critical component of swimming pool safety. Keep in mind that no one should ever swim alone. > A swimming pool can be very dangerous for children. If possible, do not put a swimming pool in your yard until your children are older than 5 years. > Keep a life preserver, shepherd’s hook and telephone by the pool. > After the children are done swimming, secure the pool so they can't get back into it. > For your child’s protection and your peace of mind, stay within arms reach of your children when in the water. Using these baby safety swimming pool tips will help you keep your baby safe! Happy splashing times!